Literally plug and play. Instructional video accurate to a T. Bang for you buck is well worth the purchase. Got the kit for my 2015 Ford Fusion Titanium. They sent me the wrong instructions (sent for a Fiesta) which was promptly rectified via email. Due to the missing instructions, I googled and found a step-by-step YouTube video that was an amazing help. I took a lot of time to detail (clean) all of the pieces. With the help of the video, I installed the GPS antenna underneath the dash where the original GPS by pulling out the instrument cluster so everything looks factory installed. That being said, do yourself a favor and find that video under 4DTech's channel on YouTube. It took me around an hour (not including a trip to the auto parts store), but I was in no hurry. Another tip is that the dash tool kit is a must! I did not realize this and had to order. The hardest part of the whole procedure was getting the control panel bezel off: you really have to "pop" it, but it finally gave. I had a major panic attack after the entire job was done. When I reset the unit, my battery apparently died in the middle of it; talk about a coincidence! I was really afraid that I messed something up! Since the car is three years old, I decided to pull the battery and run it down to Advance Auto Parts. They tested the battery and the test was inconclusive. I decided to go ahead and purchase a new battery anyways. I got home and installed it, and hit the start button. ALL WAS PERFECT!!!! As stated in the instructions, the time and GPS were off, so drove it less than .25 miles and all locked right in. Very happy that I went ahead with this purchase! Saved Up for Months. Very Much Worth the Wait & Expense! OK, for an overweight 70+ old geezer, an installation of a little over 2 1/5 hours isn't bad. Not without dropping one of the trim screws and spending the better part of an hour looking for it! Never did find it. I robbed one on the light switch housing and will look for a replacement. Just a suggestion, maybe having a $10. screw pack accessory would help? I'm pretty sure Ford sells them in 100 qty. packages, beyond reality for me. Bottom Line - Sync 3 and CarPlay for my iPhone are SO MUCH more easily readable and screens more organized. Being a 38+yr IT tech and eventually an IT manager before I retired, I fully appreciate the package and software development that went into your products. Powered on and it all matched my configuration. As a suggestion to prospective buyers, get the 7mm nut driver handle, my HF unit was a bit too long, making square fit a bit tough. If I had thought ahead, I would put a little super magnet inside the nut driver. Thank You for a great product! Best way to get OEM apple play on your pre 2016 car. Thanks for the great product. The simplest turn key up grade you can find on the net.... This is my second system form them, first one over a year, no issues even after car has been to dealer.... THANK YOU>.. I wanted to live with it a while before writing my review, I've had it since late January 2018. I've had it for a few months, and have been happy with it overall. Installation was fairly simple, I also purchased their trim removal kit. The key is to follow the instructions carefully. I used the Youtube video 4Dtech made for the fusion, pausing and rewinding when necessary. It took me about an hour to get it all installed and the trim back in place. The sync 3 is just a nicer experience even without Android Auto, the home screen has much more useful info than My Ford Touch. A side benefit is it finally fixed the bug where my car wouldn't remember which ambient lighting color I set. Since the upgrade it has stayed set to the color I wanted. It's pricey, but it's the only real option those of us with the 8"MFT had if we wanted to keep the bulk of our functionality. I only took off 1 star because I lost parallel park assist (which 4d made aware before I purchased), but it still stinks to lose something that I bought with the car. Android Auto is great, the downside is it can be finicky with longer USB cords, as I was having problems with it losing connection, until I bought a 6" USB cable for my 1st Gen Google Pixel XL . Whether these issues are something you're willing to deal with at this price, it was worth it for me and my daily L.A., 405 FWY commute. Waze running on the 8" touchscreen in my car, is way worth it. If you're thinking about this upgrade, I highly recommend you do it. If you don't have park assist there's absolutely no reason not to. Cheaper than a new car!! I am so happy with this purchase! I've been wanting the SYNC 3 system for a while now, and was very close to buying a new car in order to get it. When I found this website I have to admit I was nervous about it, but I read all the positive reviews and went ahead with the purchase. The install was a CAKE WALK! If you can work a screwdriver, you can install this stereo. It took me less than an hour, mostly thanks to the fantastic installation video on the website. Right after the install, my outside temperature was reading the wrong temp (32 degrees instead of 80), and my AC was blowing warm. I called tech support and they were AWESOME. He suggested that I drive the car for a bit to see if the temp corrected itself, and I have to admit I rolled my eyes thinking he was nuts. But I did as he suggested... got less than a mile down the road and the temp changed to the correct temp and immediately the AC started blowing cold again. I've had NO issues at all since then, and it's been in the car for a few weeks now. 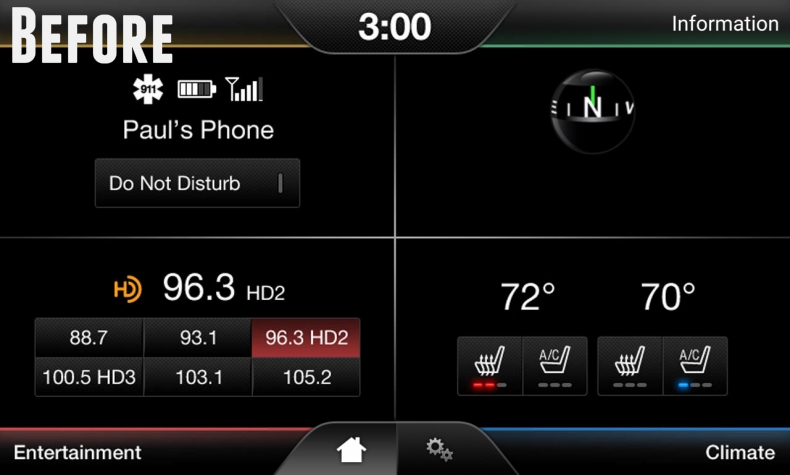 I highly recommend this system to anyone wanting to upgrade their car to the latest software. Thank you to everyone at 4D Tech, you've saved me a $30K+ purchase and made me a very happy guy! Stop thinking about it and buy this kit!!! I have a 2013 Ford Fusion energi with MyFord Touch (SYNC 2). My SYNC 2 system was failing to start up about 95% of the time. It would try to start up, then very quickly flash an error message that says "Application servicesd.exe encountered a serious error and must shut down." After some research I came across 4Dtech. They assured me this problem would be corrected, and I purchased the self install kit and the trim removal kit. I am a very very satisfied customer. Buy the trim removal kit if you don't already have trim removal tools. Some reviews on here claim they are too flimsy. In my opinion, they are just flimsy enough to avoid damage to the trim pieces. I found them to be absolutely indispensable. Make sure you have the other tools you need before you start. I had to go shopping for a T8 Torx mid-install. Read the instruction pamphlet that comes with the kit. It's not very good, but later you will understand what it was trying to tell you. After you read the instruction pamphlet, watch the installation video. It is a terrific video that shows every step of the installation. Bring your computer to the garage and refer back to the video frequently. I had trouble finding the video. The video is located on the web page where you put the kit in your shopping cart. 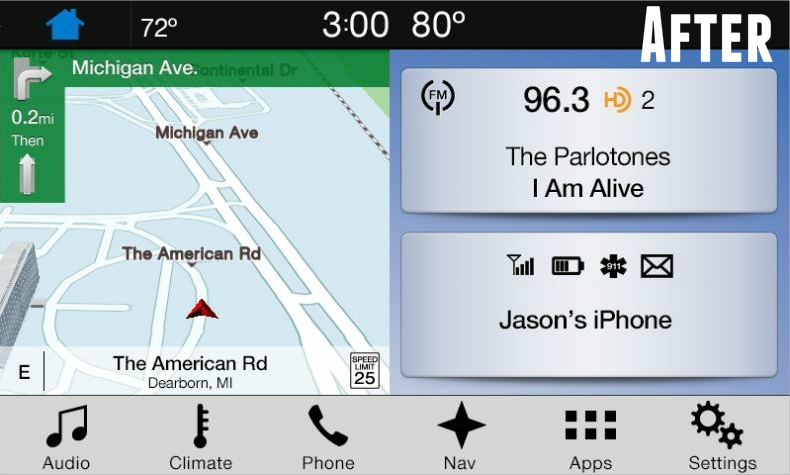 Here is the link: https://www.4dtech.com/13-15-ford-fusion-sync-3-upgrade-for-myford-touch/. It was especially useful to tell you where to put the GPS antenna. Don't do what I did and take apart half of the wrong side of the dashboard before watching the video! The one thing I am disappointed about has nothing to do with 4Dtech. There is a feature that was dropped from SYNC 2 to SYNC 3 that many people liked based on my web-research. The ability to put custom wallpapers on the screen is gone. I was hoping the upgrade would come with more features around the wall paper, maybe the ability to select some or all pictures to be included randomly so each time you start the car you get a different pic, and also, have the controls fade out so your wall paper is "featured" and the controls would return when you touch the screen. I would also add the ability to have the active energy flow screen as the background. But I digress. This is obviously not an essential feature, nor is it within the control of 4Dtech. So accept that the wall paper option is gone, and BUY THIS UPGRADE already! And remember to watch the video and to get the trim kit. I should of done this sooner. I have a 2015 Fusion with MFT 2. It works and I have gotten use to it but ever since I saw the Sync 3 1st hand in a friends Edge I was hooked, but the price kept holding me back. If you consider our Fusions are becoming a couple of model years older now, the money spent is still a heck of a lot cheaper than turning in your car for about $12,000 and spending another twenty grand more on a new car just to get Sync 3. It was just a matter of remove and replace for me, it worked right from the get go. Liked dealing with Scott, I can tell he is very customer friendly. The Android Auto works great and I am very happy although Apple owners get a snazzier interface with their phones.